Have you ever wondered, can dogs eat apples? As of me, I am always worried about my dog because he eats everything. And that’s why I am always searching on Google to know, whether a particular food item is safe for my dog or not? Anyway, so let’s see if apples are good for dogs. The thing about apples is that almost everybody love apples, and we know that this is one nutritious fruit which contains a myriad of vitamins and minerals. If you are a dog owner, you will most likely to consider apple to be part of your furry friend’s diet. Whilst most fruits and veggies are nutritious, there are some that can impose health risks for dogs. That’s why some of the fruits and vegetables are even included in the “avoid list“. In the case of the apples, yes, they are safe to be eaten by our canine companions but with caution! Aside from being a healthy food and treat, apples are also affordable compared to commercial dog treats. They are an excellent source of everything, from vitamins to dietary fibers to antioxidants. Apple helps to clean residue off a dog’s teeth, which helps to freshen his breath. Apples are an excellent source of fiber as well as vitamin A and C. Make sure to take out the seeds and the core before feeding to your dog, as these can be choking hazards. Let’s get to know more about this wonder fruit and its many benefits and some restrictions to dogs. Apples are healthy for both humans and dogs. They are even considered as a super food because of the many health benefits they offer. They are a rich source of calcium, antioxidants, vitamins A, K and C, fiber, phosphorous, essential fatty acids and pectin. It prevents joint and bone diseases and improves their gastrointestinal system. Like humans, dogs can acquire cancer and apples help fight the free radicals. 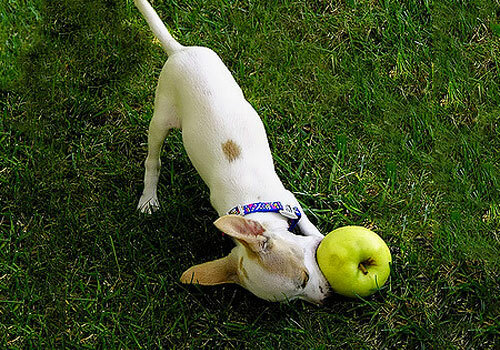 Apples are great for cleaning off your dog’s teeth, so you can assure them having fresh breath. The essential fatty acids such as Omega-3 and Omega-6 help enhance the quality of your dog’s skin, keep their coat shiny and prevent skin allergies. And because apples are rich in dietary fibers, it helps improve your dog’s bowel movement. Vitamins A and C and antioxidants, it helps prevent various illnesses as they grow old. Some experts believe that these vitamins can help with hip dysplasia. According to Dr. Oscar E. Chavez, old dogs tend to be prone to many illnesses. Thus, meaty treats should be limited to them, and they should stick to a low-fat diet. 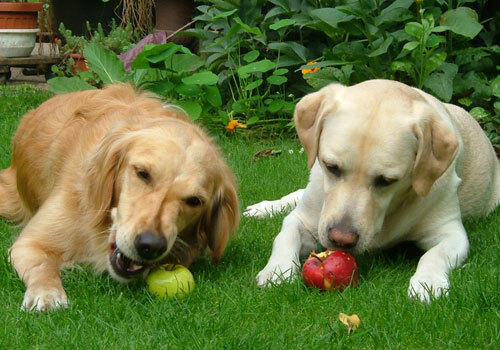 Apples are low-protein, high antioxidant and high-fiber treat for dogs. They are a great substitute for commercialized dog treats. In the case of younger and active dogs, apples are very effective in improving their gastrointestinal health and help with degenerative conditions. Moreover, meaty food products and treats are high in saturated fat, which contributes to heart diseases. Apples are low in calories, saturated fat and sodium, so you are sure that your dog is only munching a very healthy treat. So ideally, apples are really safe for dogs. Not only they get to benefit from its various vitamins and minerals, but the process of eating apples also beneficial for them too, as it helps them clean their teeth. You can make it a regular part of their dietary meal, but make sure to feed apples to your dog moderately. With all these nutritional benefits, surely dog owners will love apples as well! Why Are Apples Bad for Dogs? Despite the numerous health benefits of apples, there are some limitations to remember. While it is ideal for your canine buddy to have some apples, make sure that the apple is seedless. Moderate amount of fresh apple flesh is incredibly safe for your dog, but be cautious with the seeds. When it comes to dogs and apples, the core is actually poison to them. Apple pips contain harmful traces of cyanide. Although eating a few seeds would not have a major effect on dog’s health, however, eating a significant amount of seeds can cause a build-up of cyanide within the dog’s body. The dog’s body will be able to detoxify itself if he swallows a few seeds, so you don’t need to worry about few. Apple seeds are toxic because of the compound called Amygdalin, which is a form of cyanide. This compound can harm dogs and cause them serious illness. A dog must ingest plenty of apple seeds before it can have a significant damage on him. And because the cyanide is in the seed covering, as long as the seed cover is intact, there should not be any problems. Still, we want to be on the safe side, so better remove the core of the apples before giving them to your dog. Also, avoid feeding them with dehydrated apples. 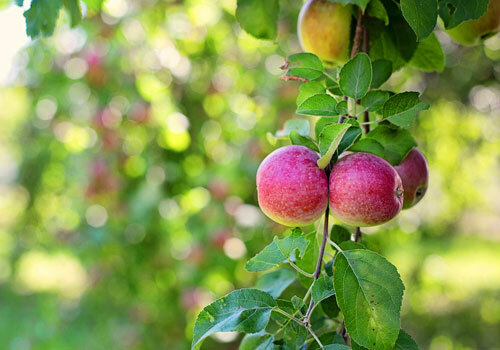 While it provides same nutrients as that of hydrated apples, but it lacks water which is critical for digestion. Dehydrated apples can cause digestive issues and stomach upset, so it’s best if you avoid giving your dog dehydrated apples. 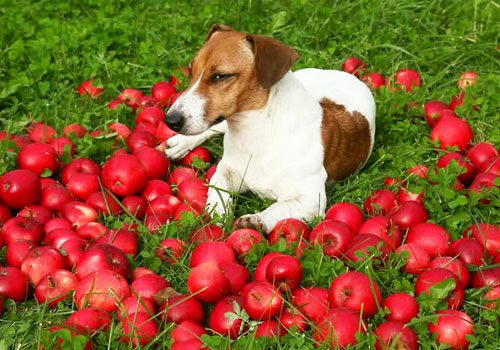 Moreover, too much of everything is not healthy, so you must not overly feed your dog with apples. According to Dr. Kerri Marshall, Chief Veterinary Officer, dog owners should give only smaller portions of apples to their dogs and introduce it gradually. Apples could also be harmful to a dog who is suffering from diabetes. Although apples for dogs are healthy, still it contains natural sugar, so better discuss this with your vet before feeding apples in a significant amount. Dogs with kidney disease should also not be given apples as its high levels of omega-6 fatty acids, calcium and phosphorus can pose them some health risks. It is highly recommended to consult with your vet for safely adding apples, to your dog’s daily diet. Food preparation is as important for dogs as feeding high-quality food. Apparently, you should not give him whole apples, or else your dog will munch on its seeds and stems, which is not safe. To avoid toxicity from apple seed and stomach upset, throw the core apple and feed your dog with apple slices. If your dog happens to eat a few seeds, don’t fret as he won’t get easily ill.
More than the toxicity issues, a whole apple may also choke your dog. 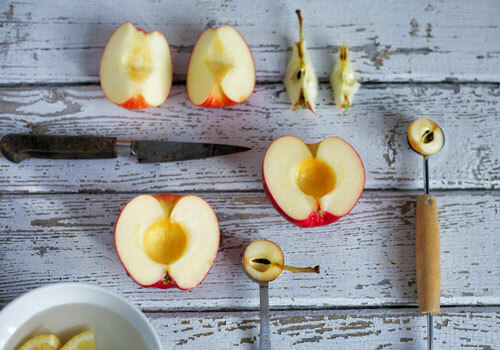 Slice the apples with its skin on because that is where most nutrients and fiber is found in this fruit. So don’t remove the skin as this can help him fight off cancer. We could be all creative and come up with various dishes and recipes containing apples on it. You can incorporate it, as an apple sauce or put it on your dog’s dinner. Apple pies, apple pops, and apple juice are great ideas, but make sure you will feed him accordingly. Never overfeed your dog or he will be obese in the long run. Remember that all dogs are unique, so some may find apples satisfying and healthy, but other dogs might have a particular reaction to it. Some dogs may experience extremely loose bowel when they’ve eaten an apple, so pay close attention to your buddy’s eating habits and bowel movement. My Dog Ate Too Many Apples! What to Do? 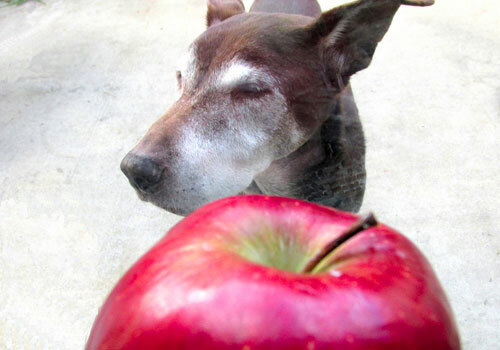 While apples are safe, but different dogs may react differently to the fruit. So start giving your dog small amounts of it and monitor his reactions. Slowly incorporate apples if this is the first time you will feed your dog with apples. Remember that prevention is always better than finding a cure for your dog. Although there is lot information about apples and other people says it is poisonous for dogs, research says otherwise. Apples are harmless. Just make sure you give your dog only bite-sized apples and remove the core. But what to do if your dog has eaten too many apples? If you feed your dogs apples in excess, then your dog is expected to experience changes in his digestive process which could lead to diarrhea or vomiting. 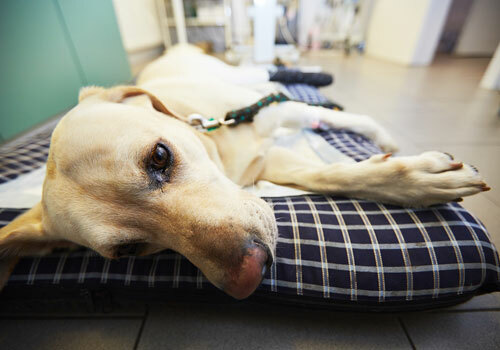 The first thing you should do is, get in touch with your veterinarian as he or she knows better about signs of toxicity and how to address it. Monitor your dog’s condition and check if there are allergic reactions or he has an upset stomach after eating too many apples or seeds. To prevent this from happening, feed your dog according to its age and level of activity. Remember, apples still contain sugar, so regardless if apples are healthy and nutritious, it can still cause illnesses if consumed in significant quality. Apple treats should also be given occasionally. Avoid giving it just before bedtime. Check the following video for more tips on apple for dogs. To summarize, below are the most common questions that dog owners ask about feeding apples to their dogs. Always remember these answers, so you can share it with other dog owners. 1. Can dogs have apples? 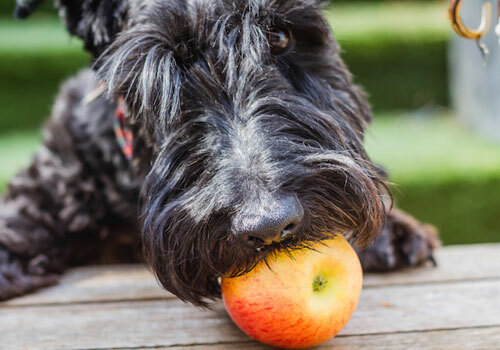 Are apples safe for dogs? Apparently, yes. Apples, in general, are safe to be eaten by dogs. In fact, it is beneficial to them the way it is beneficial to humans. It is packed with vitamins, minerals and other valuable nutrients, so you are sure that you are only giving your canine buddy fresh and healthy snack. But again, too much of it is also harmful, so pay attention to the servings. 2. Can dogs eat apple cores? Apple cores should be removed before giving apples to your dogs. It contains the harmful cyanide substance which we know is no good for dogs and humans alike. Seeds are also hard to digest thus, it may result in stomach upset or indigestion. Slice the apples, please! This would be easier for dogs to digest. 3. Are apple seeds poisonous to dogs? Yes. The seeds contain Amygdalin that has cyanide. Once the seed covering is broken, this will cause more harm when eaten by dogs. Eating too much apple seeds may also result in various illnesses and discomfort. Although, a few seeds won’t hurt your dog since he is able to detoxify his body. However, eating them over time can cause accumulation of cyanide which is hazardous. 4. Can dogs eat apple skin? As discussed earlier, apple skins contain most of the vitamins, minerals and soluble nutrients, so it is ideal to be included in your dog’s diet. However, other owners prefer to peel apples before giving them to their dogs for some reasons. Still, we recommend you not to remove the skin, or you are depriving your dogs with the real nutrients it offers. 5. Do apples give dog’s diarrhea? Yes, but only if they consume too many apples. This could cause them digestive problems as well. So make sure to limit your dog’s intake of apples. Likewise, dehydrated apples do not contain water which helps in digestion, so avoid giving it to your dogs. Make sure to keep your dog out of the kitchen, so he would not munch on too much apple pie. 6. Can dogs eat green apples? Yes. As long as it hydrated, the core is removed as well as the stem. However, dogs are known to be hunter and meat-eaters. Although fruits are well-established nutritious food for human and animals, do not allow fruits to replace your dog’s diet completely. An apple a day is fine, but you should continue giving your dog a high-quality dog food. 7. 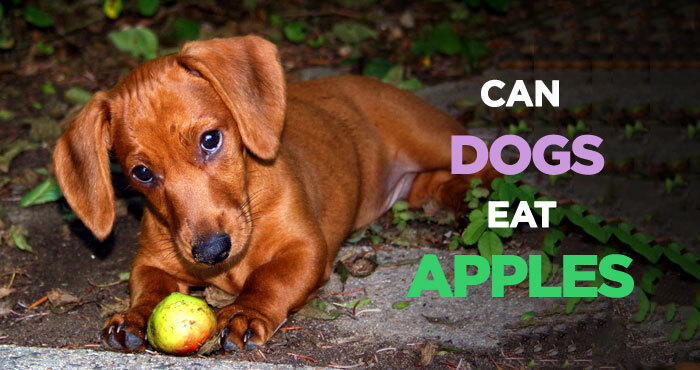 Can puppies eat apples? Puppies can eat apples as long as they are old enough to digest solid foods. Puppies 6 months old and below should be given puppy food according to their age and needs. Only give your dog apple slices if he is old enough and able to digest it. Be sure to slice apples and only give them bite-sized to prevent choking. It would also be a good idea to remove skin at the beginning. In conclusion, can dogs eat apples? In short.. Yes. Dog owners like you can give their dogs apples. These are safe for consumption given that you follow the right preparation before serving it. Like any other human foods, serving apples to your dogs should be limited and portioned. Although it can give a myriad of health benefits to our canine buddies, human foods, such as milk products or onion & garlic, can also impose a risk on them if not given properly. Just because apples are healthy, doesn’t mean you can give it anytime you want. It is still rich in sugar, which can result in diabetes, heart-related disease or obesity in the long run. 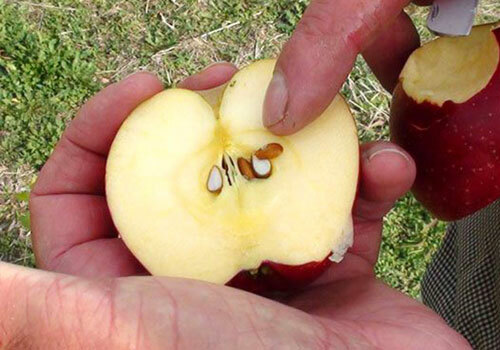 It is better for us to be cautious by slicing and removing the seeds and core of the apple. We don’t want our fur babies to become ill because of our recklessness. While giving your dog apples and other fruits and vegetables, keep providing him or her best dog food that must be based on meat protein. They need protein coming from quality meat sources. Apples should just be added as treats but should not entirely replace your dog’s food. Keep those apples in their meals to help sustain their growth and health. Thank you for putting information online. It was a big help! Please, what other food can we give our dog? I have been reading the articles on your blog, it is very keen and detailed with great care for dogs. I love caring dogs and sure, we are sailing on the same boat on this stream. I do take great care on serving healthy treats to my pooch. For my best friend, I would love to share some of the fruits which I eat, among which apple is must! Thanks for adding your thoughts Mani. I appreciate it. It is spring and our 8 mo old pup likes to find the little apples that are falling on the ground. Concerned because of the core, etc. They are small and I try to keep them picked up but sometimes she gets them first. My dog loves apple! Especially in summer I give her frozen dog treats!